Power was knocked out to hundreds of thousands of Massachusetts residents when heavy winds and rains rolled through. Relentless rain and howling winds struck the northeast and knocked out power to hundreds of thousands of people overnight. "The winds were pretty brutal here, it definitely whipped right through," said Roger Ellis of Carver, Massachusetts. The storm uprooted trees that tore down or tangled power lines. "It was probably about 1:30 in the morning," said Josh Rashid. "It was just crazy." As the storm intensified and hundreds of thousands lost power, it was what couldn't be seen that was the scariest part. "It was like really crazy, like a thunder," said Daniel Duro of Carver. "That tree just fell right down here at 3 o'clock in the morning," Duro's wife, Lamom McDonald, said. Looking at the damage from the tree that sliced through their roof and speared their bedroom wall, Duro of Carver can't believe he and his wife are alive. "Me and my wife were sleeping, and then all of a sudden, she screamed," he recalled. "The branch took the mattress and tossed me across the room." Now Duro and thousands of others remain in the dark on the South Shore as Eversource and other utility crews work to restore power. "This has been a very difficult storm. 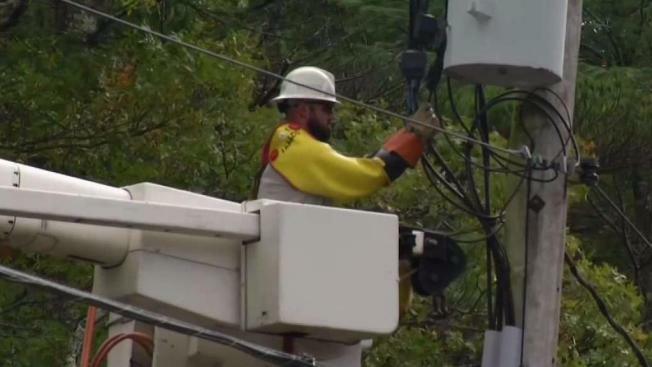 The combination of the 70 mile an hour winds, two to three inches of rain, not to mention the leaves still on the trees," said Eversource spokesperson Mike Durand. "It's caused a lot of damage to our system." And that repair work has been complicated by persistent strong winds that have slowed bucket trucks, as well as debris so large tree crews needed to assist. "You have to clear the wood away first, then you need to clear the damaged equipment, then you can make the repair," Durand said. "It's a very time-consuming process." It could be a few days before power is restored to some of the hardest-hit areas. In spite of the wind, the mild temperatures are helping to make progress.